St. Gabriel's is a community of believers who have been called by God to be a family that is always journeying forward in faith. seeking daily to respond to God's tremendous love for us by helping one another to discover, develop, and use the very special gifts with which He has blest us in order that we in turn may share His Love with everyone whose lives we touch in Titusville and beyond. Join us for coffee and fellowship after Sunday services in the Parish Hall. Our nursery is Noah's Ark located at the South end of the building adjacent to the church. Childcare is available from 9:45-11:15 am on Sundays. Sunday school for children ages 4-10 is available during the 10am service. Taizé Contemplative Service, Wednesday at 6:00pm, followed by simple supper. Tuesday Converge-ecumenical bible study including teens at 6pm. Wednesdays Bible Study at Pankey's home at 5:30 P.M. and the Parish Hall at 7:00pm. Thursdays Bible Study at Church Parlor at 10:00 A.M.
OFFICE HOURS: Monday- Friday 9:00 A.M.-12:00 P.M.
An outstanding example of the neo-Gothic architectural style, St. Gabriel's Episcopal Church was built in 1888, on land donated by J. Dunlin Parkinson, a lay reader for the mission, and by Mary E. Titus, the wife of Colonel Henry Titus, who is credited with founding Titusville. 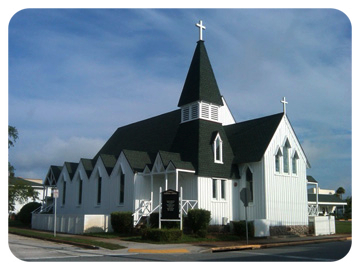 The board and batten wood frame building was dedicated on May 31, 1888, as St. John's Church. Later that year, when the congregation learned that memorial windows were being donated, one of which was to picture St. Gabriel, the name was changed to St. Gabriel's Episcopal Church. All the stained glass windows in the church, with the exception of St. Luke, were made in England and finished in New York at either Lamb and Tiffany's or Gorham's, Fifth Avenue. The windows are considered to be one of the finest collections of Victorian stained glass on the East Coast. The building was remodeled and extended in 1962 to its present configuration. Originally seated for one hundred, the enlarged church building now seats more than two hundred. St. Gabriel's was listed in the National Register of Historic Places on February 16, 1973. The bell in the bell tower was donated by the ladies in the church in 1892, and is said to be the largest bell in Brevard County. In 1992, the congregation, with the assistance of a state grant and community support, generously donated money for a major restoration project to replace support beams, to reroof and repaint the church.